Some wore bandanas and others used props, but all brought coordinated, high-energy performances to the Gamma Phi Sigma “Hermanos Unidos” fraternity’s annual Stroll Show. 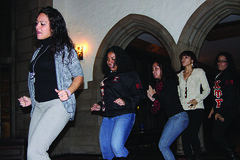 On Friday, Nov. 19, Mitten Hall was filled with hip-hop beats and an energetic crowd, as Greek teams competed in the sixth annual Latin-influenced performance. Strolling is a kind of line dance that originated in the 1950s during the “American Bandstand” era. Participants line up and perform coordinated moves with others in the line or form two columns that couples take turns passing through. Gamma Phi Sigma President Randy Narvaez-Ruiz served as the event coordinator for the last two years. Planning the event meant involvement in everything from start to finish – from inviting other organizations to participate to overseeing the final itinerary the day of the show. Beyond an entertaining Friday evening, attendees and performers supported a cause that is of great importance to the brothers of Gamma Phi Sigma. This summer, Ramon “Guatu” Baez, a Gamma Phi Sigma brother, passed away after battling a rare form of brain cancer. The fraternity decided to hold this year’s stroll in his honor. Eric Cortes, the event host and vice president of the fraternity’s national board, asked for a moment of silence at the event in honor of Baez. “It’s been a tough year for us as a chapter, and as an organization,” Cortes told the crowd. The stroll allowed the group to move forward positively in Baez’s memory. Both this year and last, the proceeds from the event were donated to the American Cancer Society. A panel of five judges, three of whom are Greek affiliated, scored the teams’ synchronization, creativity, difficulty and enthusiasm. In the first round, audience members voted on the teams by donating money, all of which went to the American Cancer Society. Teams were required to prepare three separate strolls, each no more than two minutes long. The competition showcased the talents of Greek brothers and sisters from several East Coast schools including Kutztown University, University of Maryland and Temple. Daniela Acosta has been a member of the Lambda Theta Alpha Latin sorority since spring of this year and is currently the fundraising chair for Temple’s chapter. It was her first stroll performance, though her sorority participated in the event for the last three years. For the three women who performed from Lambda Theta Alpha, each of the stroll routines held different meaning. While teams brought their own unique style with each routine, the Chi Upsilon Sigma sorority from Kutztown received first place. The first-place prize included a $500 donation by Gamma Phi Sigma in the winning team’s name to a national or local philanthropy of their choice. This year’s donation was made to the I Have a Dream Foundation – an organization that gives financial support for higher education to children in low-income communities. Junior Gabriela Sanchez attended the event for the first time this year after hearing positive reviews of past events from friends. Kara Savidge can be reached at kara.savidge@temple.edu. Temple Refugee Outreach raised more than $3,000 for scholarships for refugees on Friday in Mitten Hall. The former U.S. Army officer said he was discharged after announcing he was gay.